A disk, remote control bulldozer, and foam inner tube are utilized to demonstrate no-slip wheel relationships. This demonstration should take 8-10 minutes. 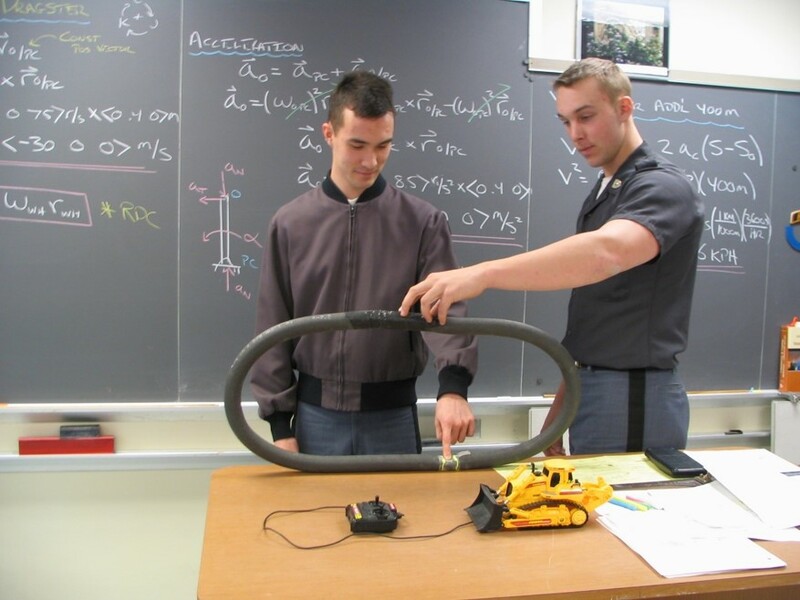 Before Class: Prepare foam inner tube and disk with holes in it. 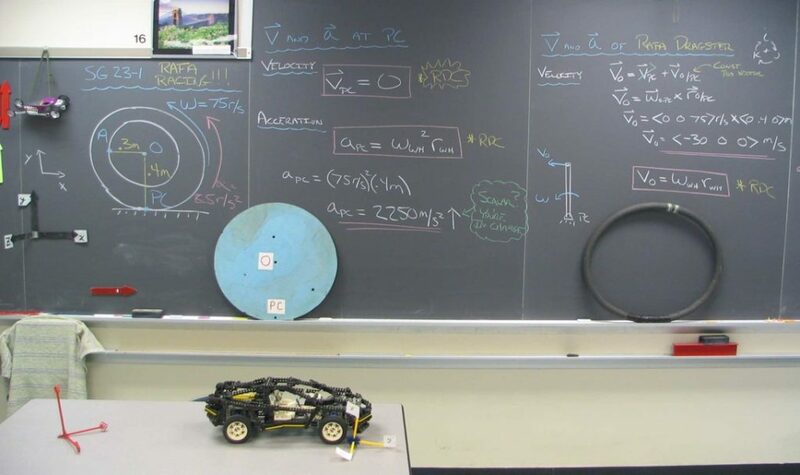 In Class: Discovering that the velocity at the point of contact for a no-slip wheel always gets a reaction from students. First it is plainly stated. Asking for “non-believers”, a volunteer places his or her finger on a point on the bottom of the track of a remote control bulldozer. As the bulldozer moves forward, the student’s finger doesn’t move! For those who can’t see, the larger foam inner tube really makes this clear to see. Stating that this seems like some sort of magic trick, one offers a mathematical demonstration with the disk. 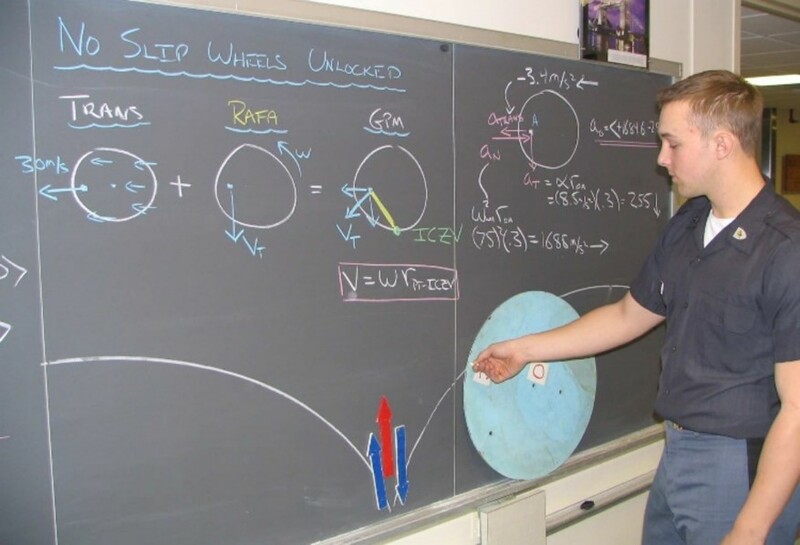 Tracing the position of the point of contact on a chalkboard as the disk rolls forward, one can than show that the velocity must change direction as the point of contact touches the contact surface. In order for this to occur, it must pass through zero. Additionally, to change the velocity, acceleration must be present. The disk can also be utilized to define and demonstrate the instantaneous center of zero velocity (ICZV) at the PC. Rocking the disk back and forth, it is clearly shown that the entire wheel rotates about the ICZV at any given instant. Did you try this? Comment below to let us know how it went. Tom Messervey (2017), "No Slip Wheel," https://www.handsonmechanics.org/dynamics/304.